Joseph Wicks is now Assistant Director of Music at Truro Cathedral, a post that he took up in September 2017. He is also Musical Director of St Mary’s Singers, the cathedral’s voluntary choir, sings tenor in The Gesualdo Six, and has founded his own chamber choir, The Beaufort Singers. Joseph’s duties at Truro include assisting the Director of Music, Christopher Gray, in the training of the boy and girl choristers, conducting services and mentoring of the choral and organ scholars, as well as playing the world-famous Father Willis organ for the majority of daily sung services. Prior to this Joseph was Assistant Organist of St John’s College, Cambridge, having been its Herbert Howells Organ Scholar. While at St John’s, Joseph played the organ for a large proportion of the daily services sung by the world-famous Choir of St John’s College, Cambridge and also accompanied them on their busy broadcast, recording and international tours, including to Denmark, France, Germany, Hong Kong, Italy, The Netherlands, Singapore, Switzerland and the USA. Joseph also conducted the College Choir frequently, and for his final two years was Musical Director of the Gentlemen of St John’s with whom he recorded a CD entitled White Christmas. Joseph began his musical education as a Chorister, later Bishop’s (Head) Chorister, of Salisbury Cathedral. He moved on to Lancing College as a Walter Stanton Music Scholar, and was later awarded their Sixth Form Organ Scholarship. He then spent a gap year as Organ Scholar of Hereford Cathedral before moving to St John’s in 2013. 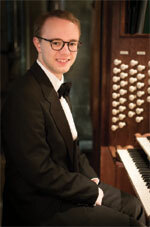 Joseph is a Fellow of the Royal College of Organists (FRCO) winning the Limpus, Shinn and Durrant prize for the highest mark in the practical examination. Joseph has given recitals in Westminster Abbey, King’s College, Cambridge, several other Cambridge colleges, and various cathedrals, municipal halls and churches across the UK. In addition, Joseph maintains a freelance career as a singer. He is a graduate of Genesis Sixteen, a training scheme for young singers run by The Sixteen and its director Harry Christophers. Joseph has sung with groups such as Alamire and Polyphony, and is a founding member of The Gesualdo Six, a vocal ensemble who specialize in both renaissance polyphony and modern works. Having performed several times on BBC Radio 3 and given concerts across the UK and more widely in Europe, the group have released their debut CD recording of English renaissance masterpieces.